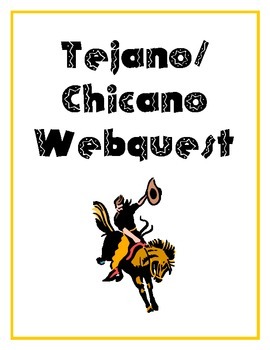 This webquest is a great introduction to learning about the tejano and chicano cultures in the United States! 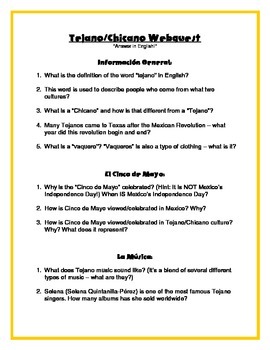 Students will learn about Mexican-American heritage, the background story of "El Cinco de Mayo", and learn about musical influences of famous chicano musicians, Selena and Ritchie Valens. 2. 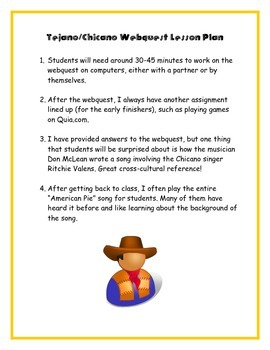 After the webquest, I always have another assignment lined up (for the early finishers), such as playing games on Quia.com. 3. 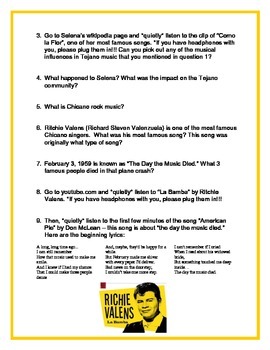 I have provided answers to the webquest, but one thing that students will be surprised about is how the musician Don McLean wrote a song involving the Chicano singer Ritchie Valens. Great cross-cultural reference! 4. After getting back to class, I often play the entire “American Pie” song for students. Many of them have heard it before and like learning about the background of the song.